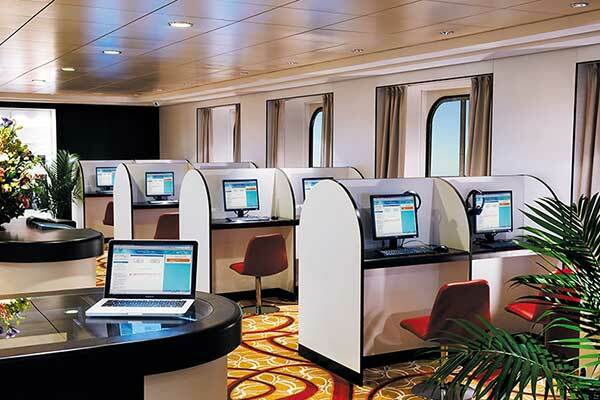 CyberCafe@Sea™ is a highly flexible Internet Café solution is designed as a user-friendly application that allows cruise lines to provide guests and crew with user configurable internet plans based on time, data, quality of service (QoS), length of cruise and other criteria. The customizable User Interface (UI) can be branded to meet the customer’s corporate identity and guest-facing text/messages can be displayed in multiple languages. 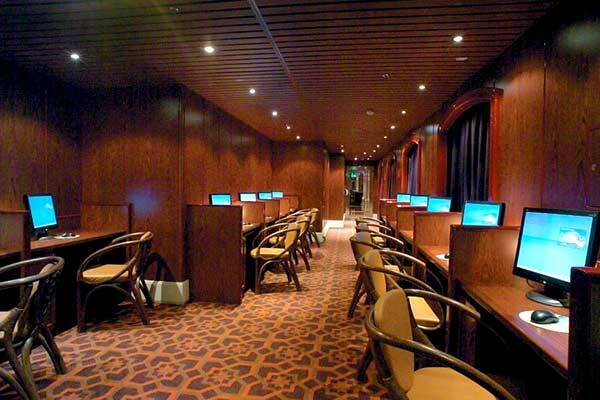 Users seamlessly connect to the Internet from virtually anywhere onboard using wired Internet Café workstations or connecting to Wi-Fi Hotspots. The UI recognizes and supports the varying range of screen sizes found on mobile devices such as iPads, iPhones, Android phones & tablets, etc. CyberCafe@Sea™ interfaces with the major PMS (Property Management Systems) providers in the industry for user authentication, authorization and charge posting. It also works with all the major satellite providers who provide the Internet bandwidth. NO REVENUE SHARE BUSINESS MODEL – Customers define and manage Internet pricing and retain all revenues generated from the Internet Café system. CUSTOMER BRANDED – Guest facing web pages customized with customer logos reinforcing customer branding and identity. FLEXIBLE INTERNET PRICING – User configurable Internet pricing packages for guest and crew by time, by byte, length of stay, loyalty level, cabin category, and more. Free sites are also supported. 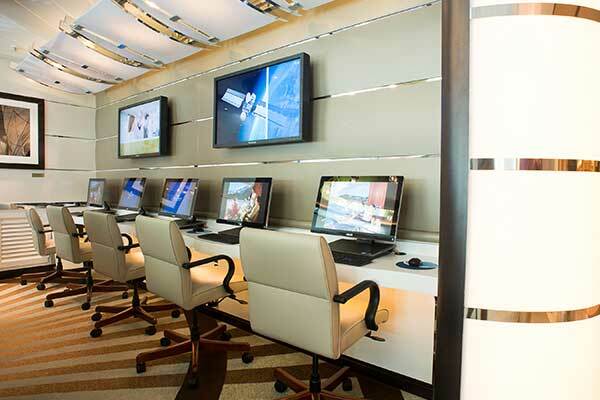 ONLINE REGISTRATION AND BILLING – Guests login and register from their personal device or wired Internet Café workstation. Real-time connection to a Property Management System authenticates guest for access and billing of Internet usage charges. Internal user authentication and billing for customers without a PMS system. MOBILE DEVICES – Designed for today’s WiFi enabled devices such as Apple iPhone, iPad, Android and Windows smartphones, tablets and laptops. PALO ALTO / CISCO INTEGRATION – Create specialty Internet packages i.e. Social Media packages with access to only predefined social media sites. Block access to sites by application and user (guest and crew). MULTI-LANGAUGE SUPPORT – Configurable to accommodate any western language. SEAMLESS LOGIN – allow known devices to bypass the login page and access the internet. NOTIFICATIONS – Customizable messages to advise guests of pricing, package expiry, loyalty rewards, etc. PROPERTY MANAGEMENT SYSTEM (PMS) INTERFACE – Interfaces to the industry standard PMS systems and other proprietary PMS systems. EASY LOGOFF – Timed auto logoff, network disconnect (airplane mode), and user friendly messages help users to logoff and protect against overcharging and guest complaints. SECURITY – Integrated security features prevent breeches and system disruptions. The system is installed on its own network separate from the main corporate network. REPORTING – Cruise/Voyage reporting on sales, internet usage, package usage, refunds, bandwidth utilization, etc. SUPPORT – 24x7x365 Help Desk with on-site support and training available as needed.